Ensuring the proper digestion of consumed calories is an essential part of bodybuilding. The body requires the breakdown of food molecules as a source of nutrition and energy. Food enters the mouth and travels the digestive system to the stomach were digestive enzymes begin these breaking down and absorption processes. These digestive enzymes, including the endopeptidase known as pepsin, need to function properly to effectively bodybuild. What Is Pepsin & What Does It Do? Pepsin is a major digestive enzyme that is produced by and functions in the stomach. Pepsin specifically targets proteins for digestion, as proteins are an essential nutrient for fitness-related activities. Proteins from foods like eggs, meat, nuts and seeds, and dairy products are broken down into smaller units known as polypeptides. Pepsin also functions in absorption processes in the stomach and helps to protect the stomach from foreign substances. Low levels of pepsin in the stomach can lead to indigestion symptoms like acid reflux and heartburn. Protein absorption primarily occurs in the small intestine. These smaller polypeptide units can only be absorbed and transferred into the bloodstream after protein breakdown by pepsin. Pepsin often follows undigested proteins through the digestive system to ensure that they are properly processed. Therefore, pepsin is an essential digestive enzyme needed for the consumption and absorption of proteins and the protection of the stomach from acidic and allergen foods. The natural bodily production of pepsin correlates with the number of proteins consumed. An increase in pepsin occurs as more proteins are pepsin. This increase is necessary to maximize the absorption and utilization of protein substrates. All of the digestive enzymes in the body contribute to the appropriate nutritional acquisition from proteins and other foods. These enzymes include other proteases and peptidases like pepsin, lipases, carbohydrases, and nucleases. As mentioned, pepsin and similar proteases and peptidases split proteins into amino acid polypeptides. Lipases break down fats into fatty acids and glycerol. Carbohydrases break carbohydrates into sugars as a source of energy. Lastly, nucleases produce nucleotides by breaking apart nucleic acids. All of these enzymes function as catalysts for the digestive chemical reactions of the body. It is important to sustain these enzyme levels and chemical reactions to nourish the body while following a bodybuilding regimen. Bodybuilding requires a high consumption of proteins and carbohydrates to replenish the energy lost during exercise. Proteins are also necessary for muscle building and repair; the polypeptides absorbed in the stomach prompt the protein synthesis that creates muscle fibers. High-intensity exercise like bodybuilding quickly consumes existing protein that is stored in the body, and these stores get replenished. The proper digestion of proteins ensures the absorption and utilization of nutrients and aids in muscle repair that is required by intense bodybuilding regimes. This digestion is made possible by a variety of digestive enzymes, including the important protein-degrading pepsin enzyme. The appropriate replenishment of muscular proteins is made possible by the broken down amino acids from proteins. It is hence necessary to maintain nutrient and enzyme levels while bodybuilding so that muscles can continue to develop and grow. Finding a premium digestive enzyme supplement that WORKS, can be difficult with all of the choices on the market today. Luckily, we at CrazyMass have developed a high-quality bodybuilding supplement that includes pepsin to increase protein synthesis and assist with digestion during workouts. 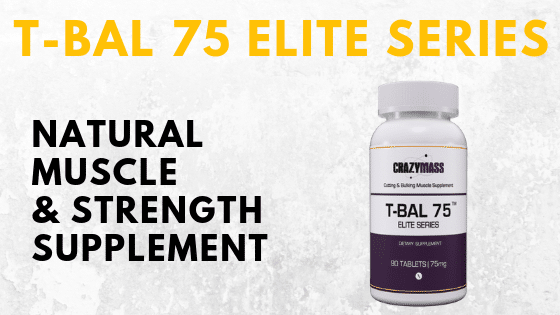 Possibly the most versatile legal all-natural alternative to Trenbolone, T-Bal 75 can be used for bulking and cutting cycles, and T-Bal 75 is a critical element of our Bulking Stack and, in the premium Crazystack Ultimate Stack.